A charming purchase for 20p. 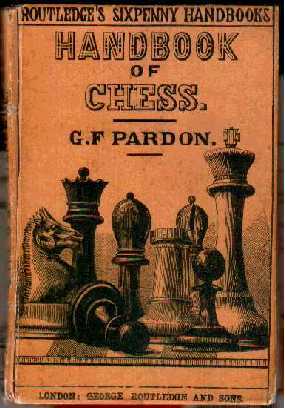 printed in 1863.
side of the board. " with how the Knight moves in the future. by which the outer squares are first filled." He then scores the Knight as being worth 3 and sometimes 4 pawns. It's official folks. Knights are better than Bishops. Morphy was one-sided. I wonder if Mr Pardon played Mr Watt and they misheard each other. "I'm Watt. What is it?" "Pardon me but you are Pardon. What!" was that I back home in time to see the new Dr. Who. It was brillo mungo. I thought Billy Piper was great. I thought she might ham it up but she was OK.
My one gripe is why did they tamper with the original music. The new one is all trumpets and jazz. I hate jazz. that jazzed up crap and bring back the original. If they want to they can borrow my CD. 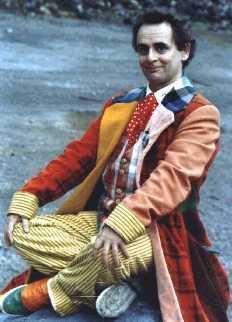 I met Sylvester McCoy in Bells a few years back. True. To my everlasting regret I never took a photograph. I bought him a pint and we spoke of Dr Who episodes. couple of hours so we could carry on drinking. He groaned. "I wish I had £1.00 everytime I heard that one." calling 1 e4 c6 2 d4 d5 3 Nd2 Qb6 the Edinburgh Variation. I was emailed by people saying the 3 a3 in the Vienna already had a name. It us called the Mengarini Variation after one Ariel Mengarini. against our very own Dougie Bryson in Hastings 1980. I really must be more careful when pulling openings out of the air. OK now I'm left with a dilemma - I have to invent an Edinburgh Variation. I am playing in the Edinburgh Congress in 5 days time. I'll invent a opening/variation and play it there. Now who else have I upset - ah yes The French. On the left is the one that is on the site - the wrong one. Correct is the flag on the right. I'll just leave it as it is.